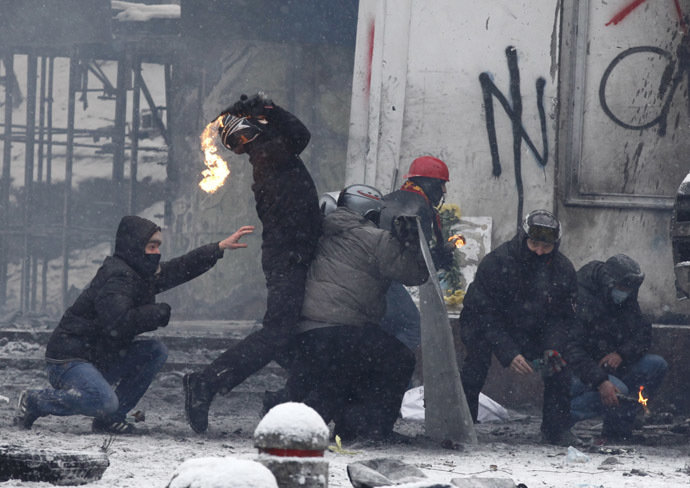 Demonstrators threw Molotov cocktails at riot police from the top of the Dynamo Kiev football stadium in central Kiev beginning January 19. Police responded by using stun grenades and tear gas against the mobs. Vehicles were torched by the hooligans from the neo-Nazi Pravy Sektor. 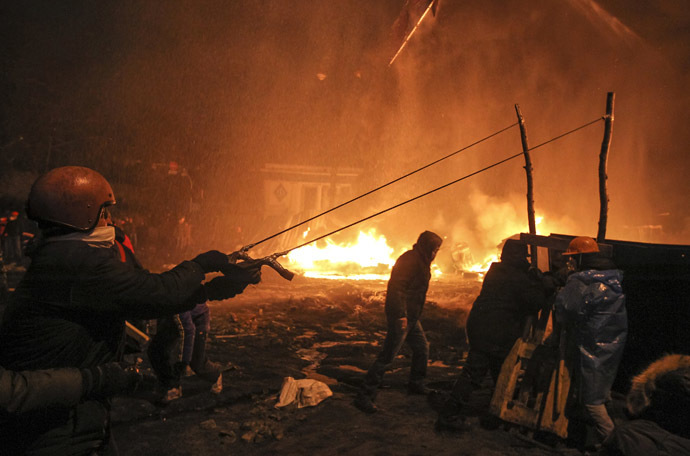 More than 60 police were hospitalized from barrages of rocks, stones and Molotov cocktails. The core of Pravy sektor is made of the activists of radical groups, including ‘Trizub’, ‘Patriot of Ukraine’,as well as UNA-UNSO and the ‘Svoboda’ (Freedom) ultra-right party, which won nearly 10 percent of votes at the last parliamentary election in Ukraine. They are ‘pro-EU’. Curious is the fact that in the beginning of the protests, Pravy Sektor members were calling themselves‘the Maidan self-defense force’. They had been designated by the main opposition leaders – Vitaly Klitschko, Arseny Yatsenyuk and Oleg Tyagnibok – to provide security for peaceful protesters. Now they clearly have split from the peaceful protests. A review of the official statements from Nulland, who met personally with opposition leader Klitschko in early December, is instructive of the open interference of Washington in the internal affairs of Ukraine. Nulland – a Hillary Clinton appointee who now is assistant secretary of the Bureau of European and Eurasian Affairs in the State Department – did not respect a sovereign decision by Ukraine’s government in November 2013 not to accept the dismal terms offered by Brussels for a Ukrainian EU‘Association’ status.